Recently I’ve been seeing a lot of posts shared from the Matt Walsh blog. I gather that Walsh has a radio show somewhere and the blog is an extension of that. Some of the posts of his that I’ve read, I’ve enjoyed, even if I didn’t agree with everything in them. In fact, it’s probably fair to say that if you took a one-sentence summary or thesis of the main points of his blog posts, I’d probably agree with the overall gist of most of them. What’s really disappointed me though, especially considering how viral some of these posts go, is the manner in which a lot of these opinions are expressed. And with his latest post on homeschooling… well, I just felt like I had to write up a bit of a response to it (okay, a really long one – whatever!). To be fair, I have never met or listened to Matt Walsh, and this is in NO way an attack on him or even his core beliefs – just a response to what he said in this post. I don’t exactly want to give him more traffic, but I do believe in citing sources, so here it is: We Are Going to Home School Our Kids But That’s Only Because We Hate Education. For starters, it should be noted that Matt Walsh is not currently a homeschooler. His children are not yet school age, and he was not homeschooled himself, so it’s fair to say that while I’m no more of a homeschool parent than he is, being homeschooled for 13 years probably means I have more experience with it than he does, and likewise, he has more experience with public (pre-college) education than I do. He starts out the post sharing very short snippets of comments he received after a broadcast. I didn’t listen to the broadcast, but if it resembles the nature of his blog posts, I imagine there was probably a lot of ranting, raving, and judgment. So it’s really not surprising that he would receive negative comments from people who were offended, as anger and judgment tend to stir up more anger and judgment. He uses these out-of-context snippets as the launching point for the post. One of these comments, of course, involves Hitler, which seems way too early in any piece to be bringing up Godwin’s Law, but it strikes me as an especially inflammatory way to start a blog post. Sure, that does sound like a pretty terrible thing to say to someone, regardless of what the actual context of the comment was, but it also provides an opportunity for Walsh to begin his post from a reactionary point of view – encouraging the notion that he is under some form of “attack” for expressing his beliefs (a tactic that he has employed in several previous posts as well). He goes on to talk about some of the horrible things people have told him about public schools. And yes, I’ve heard some horrible things about them too. Some of them were even from sources other than Fox News. Only one of these examples he uses includes any kind of source citation. This leads into what is probably his main point, that government schools exist to instill the beliefs and propaganda that the government wishes people to have. I think this point makes sense, and can be helpful in encouraging parental awareness of what is being taught, but I believe it also unfairly minimizes the extremely nuanced realities of each school, school district, and teacher. According to the National Center for Education Statistics, there are over 100,000 public schools in this country, employing over 3 million teachers. Numbers like that mean there will be a lot of variables when it comes to the ways in which education is carried out. It seems an oversimplification to present the government involvement as a guaranteed means of mind control. Walsh implies (though how exactly he made the connection is unclear) that government education leads people to viciously attack others for having unpopular opinions. Not only is this paragraph inflammatory, but given the fact that 1 in 10 students do not attend public schools, it also seems like it would be rather difficult to tell which of the “attackers” or “people who can’t form a coherent thought on facebook” he mentions are actually products of public education and which are not. Did he take a poll? Does he keep tallies of which of his friends produce poorly written status updates and cross reference that data with their educational backgrounds? Unlikely. That entire paragraph is based on a lot of generalizations and weak assumptions. If you start with the assumption that government schools are evil, then just about anything you find in society can be attributed to that if you try hard enough, which is why it is generally inadvisable to start with a conclusion and then work backwards. Once again, this goes back to the beginning of the post, striking a tone of persecution. I know there are homeschooling families who have been persecuted for what they do, so yes, it’s safe to say that some people DO hate homeschooling. That is a terrible thing, and I have a lot of admiration for the attorneys who are fighting for their freedom. Because homeschooling is a parental right. But I would be careful in putting forth too generalized of a “people hate homeschooling” message. Maybe people just tend to get their dander up when listening to angry rants that rely so much on assumptions and paint others with broad brushstrokes. Certainly Walsh is not happy with those who make negative assumptions about homeschooling based on anecdotal evidence – why is it okay for him to use the same tactics to vilify public schools? Only in America (and other nations where the family structure is disintegrating) could we decide that parents are incapable of helping their children “develop the powers of reasoning and judgement.” In fact, in more primitive times, folks would have been crazy enough to think that ONLY parents are suited for that job. I definitely believe that families are important, and that the disintegration of the family unit is a bad thing. But I find this statement misleading in a number of ways. First of all, the existence of public schools and the encouragement of their use does not mean that we believe parents are incapable of helping their own children learn. I’m sure some do, and that is unfortunate, but these things are not mutually exclusive. Then the second sentence suffers a bit from the “noble savage fallacy” – the act of idealizing people from more primitive times and cultures, with the assumption that they possessed some kind of innate wisdom that we have since lost. The fact is, if you’re reading this, you’re not living in a primitive place or time. Some primitive practices and ideas were timeless and are still valid today, and if so that’s because they are good, not because they are primitive. I’m glad my parents, while still using traditional values, aimed to raise me to be successful in the era that I am in – not in one that no longer exists. I’m also glad they took control of my education without limiting it to such a degree that they were the only people in the world who were allowed to teach me anything. But indoctrination and education are dimensions of each other. Indeed, indoctrination can be defined as “teaching or inculcating a doctrine, principle, or ideology, especially one with a specific point of view.” Doctrines and principles are inexorable parts of the process of passing on knowledge and information. The question before us is: who ought to be in charge of this task? Both Walsh and I have the same answer to this question: parents. I believe that the best step to a good education is involved and invested parents, because both my husband and I have seen that at work in the families we grew up in, even though I was homeschooled and he went to a public school. But where Walsh and I differ is that, even as a homeschooler and hopeful homeschool mom someday, I also believe that good parental involvement does not have to mean homeschooling, nor should educational options be presented as objectively hierarchical! Which really shouldn’t be an extreme statement at all, but based on the elitism and “all or nothing” sort of approach that is put forth here about homeschooling, I think it needs to be said. If you don’t want your kid subject to government propaganda and government control, then don’t send him to a government facility 6 hours a day, 5 days a week, for 13 years of his life. Or go ahead and send him — perhaps you have no choice, I understand that — but confront the reality of the situation. And while it’s wise to “confront the reality of the situation” – i.e. being aware that government schools have disadvantages, and will teach principles that some parents disagree with, that doesn’t mean some parents don’t still choose, for their own reasons that certainly do not need Matt Walsh’s approval, to send their children to these schools. Yes, parents are the chief influences in their children’s lives, and are ultimately in control of their education, but this is true regardless of which educational choice(s) they make for their kids. Either public, private, or home schooling (or a combination!) have their pros and cons, and can be best for one family or child, depending on the situation. It pains me to read blog posts like Walsh’s that paint such choices as so “either/or,” using paranoia and hyperbole to air his opinions. He’s preaching to the choir. Those who already agree with his premise might feel happy that he’s validating their choices (or just be annoyed at tactics that are inflammatory rather than informative), while those who disagree with his premise are going to be enraged rather than “converted” by his rantings and judgment. The point that parents are ultimately in charge of the task of education is a point that, while important, could have been made in a much more compassionate and less sensationalized way. And I certainly hope that any non-homeschoolers who read the opinions in that post do not take them as indicative of what all homeschoolers believe, because they are not. The last time communion was served at our church I started thinking about the fact that I can no longer participate due to my problems with gluten. 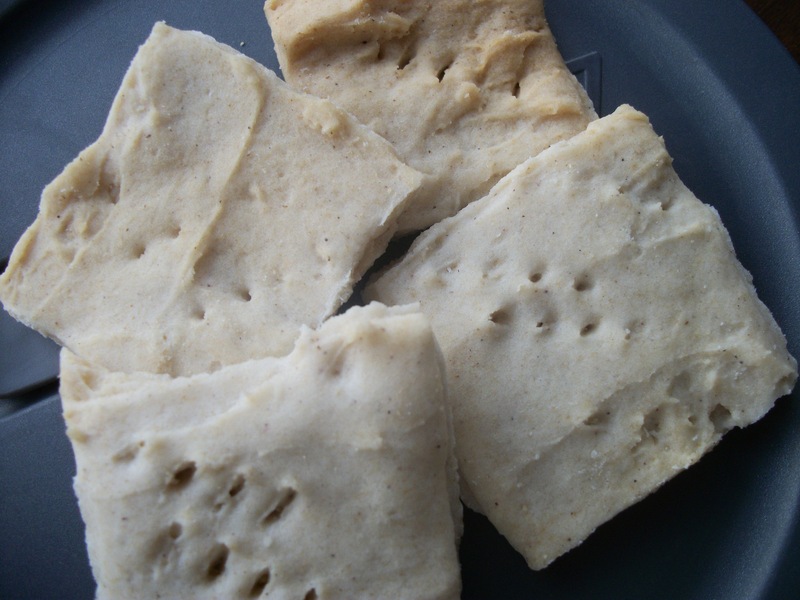 That got me started thinking about unleavened bread, and I started looking online for gluten-free cracker recipes. I found a few that looked like they might work, but they called for rolling out dough (usually between sheets of parchment paper). I hate rolling out GF dough, so I decided I was going to invent my own recipe. Attempt number one was a disaster (a disaster so disastrous that we almost needed to clean the oven when I was done!). Attempt number two was less disastrous than the first (I actually ate the crackers, instead of throwing them away, and no injury was inflicted upon the oven). The third attempt was what I would consider a success. The flavor was quite nice, and the crackers remained crunchy, even after a couple days. Since I avoided the “roll it out” process, you’ll notice that my crackers are very non-uniform. That just adds to their charm, in my opinion! Combine all the flours, baking powder, salt, and xanthan gum. 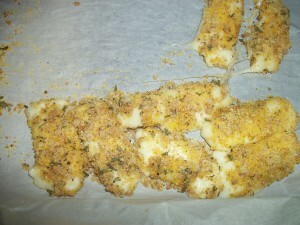 Cut the butter into the mixture with a pastry blender, until the mixture resembles coarse crumbs. Add the water a bit at a time, stirring together with a fork as you do. Use a sprayed spatula to spread the batter evenly on a stoneware baking pan 10.5 x 15.5 (approximately 160 square inches). Make sure you spread the batter as evenly as possible, to avoid very thick or very thin areas. Thick areas will end up doughy, and thin areas will become too crisp/scorched. Use a knife to cut the batter into small squares, and a fork to pierce it. Place the baking pan in the oven and cook for 40 minutes. After the first 30 minutes, you’ll want to start checking the crackers every few minutes. If you see portions starting to brown, it’s time to pull them out! It’ll come out of the oven as one giant cracker, but it’ll easily snap into squares where you cut it with a knife before baking. * I’ve tried a couple different ways of spicing up my crackers. One way was to add a little bit of garlic salt and/or onion powder into the mix. Another was to add some rosemary and thyme (I refer to them as my ‘Scarborough Crackers!’). What else could you try? Well, at some point I’m going to try adding some chili powder or cumin. Maybe sometime I’ll try mixing in some pepper. Experiment, and let me know what works for you! 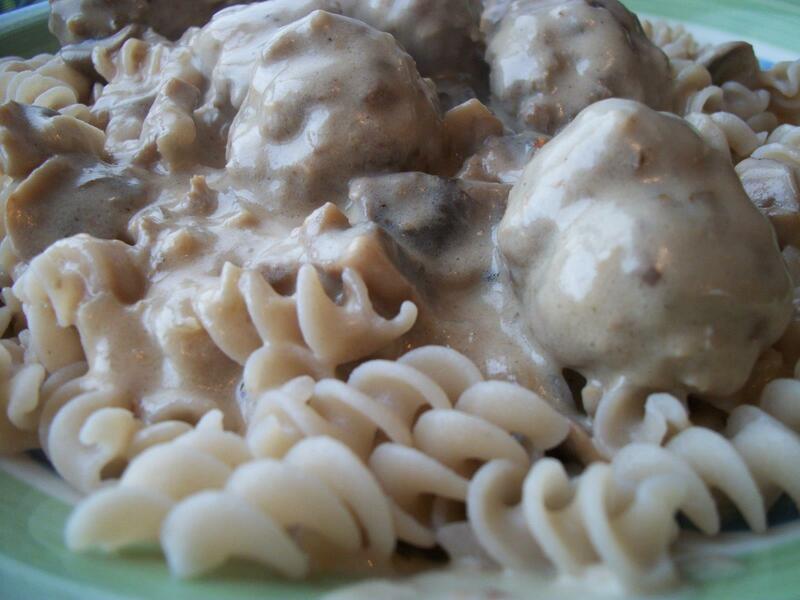 Do you know what Swedish Meatballs are? I don’t. I’ve had them many times, and for every person who has served them, there has been a very different recipe. 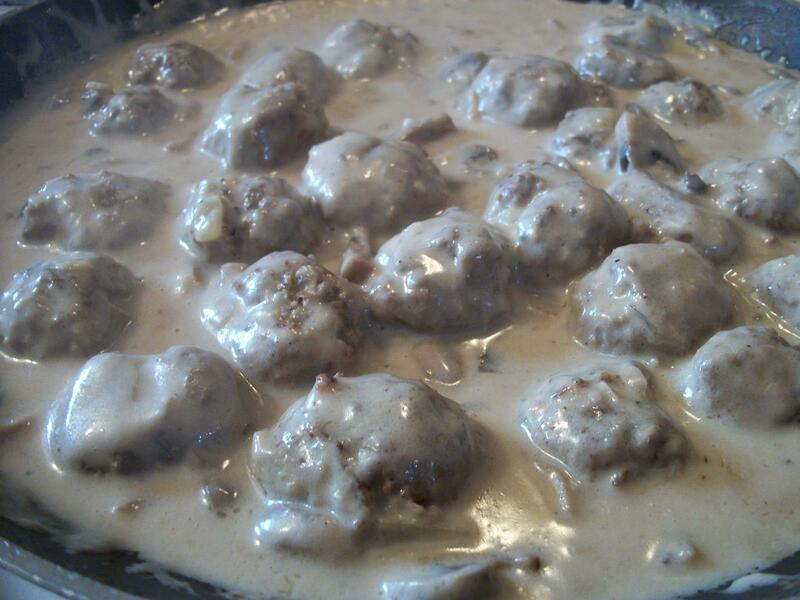 Maybe someday I’ll ask my Swedish relative for a precise definition, but in the meantime, this is my conglomeration of what I like best about different meatballs-in-a-gravy recipes I’ve had. Plan on an hour to 1.5 hours to cook this, depending on how long you intend to let the sauce simmer. Add 1/4 large onion diced, and saute it along with the other vegetables. Preheat the oven to 375 degrees. Yes, you could pan fry the meatballs, but once someone pointed out to me that I could bake them in the oven instead, I’ve never gone back to pan frying – it’s far more hassle than it’s worth! In a large mixing bowl, mix the ground beef, bread crumbs, onions, and the seasonings. In a separate bowl, beat the egg and mix in the milk and melted butter. Pour the liquid ingredients over the meat mixture and thoroughly combine. Either by hand, or using a handy-dandy meatball maker, make the meatballs and arrange them in a baking dish. Cook them for 1/2 hour at 375 degrees. While the meatballs are cooking, make your mushroom soup. Take the meatballs from the oven with a slotted spoon, so excess grease will drip out, and add the meatballs to the soup. Let it simmer as long as you like, until it’s as thick as you want it. I usually let it simmer for about a half an hour. But what are you going to serve this on? Well, it’s really up to you! Serve it with gluten-free pasta, or maybe with rice, quinoa, or whatever grain suits your fancy! This recipe feeds Laura and me for two meals, so it’s about 4 adult servings. Mozzarella sticks are delicious, but not something that’s usually on the menu for someone who’s avoiding gluten. So I thought I’d attempt to make a gluten-free version at home. I thought they turned out pretty well. *If you have gluten-free bread (see our recipe here), you can make gluten-free bread crumbs fairly easily by toasting the bread (I used two heel slices for this recipe and had some left over) until they are well done (without being too brown!) and then grinding them up in a food processor. You can also add seasonings if you like. I added about 1/2 a teaspoon of salt, a tiny bit of pepper, a few shakes of Italian seasoning, and about 1/4 a teaspoon each of garlic powder and onion powder. 1. Cut the string cheese sticks in half, place them spread out on a piece of parchment paper, and put them in the freezer for at least an hour. 2. Once they are frozen, remove and set up 3 dishes for the coating. Dish #1: flour. Dish #2: the egg and milk, beaten together. Dish #3: the bread crumbs, corn meal, and parsley, mixed together. Take each stick and dip it first in the flour, then in the egg mixture, shaking off the excess, then into the crumbs, turning and pressing to coat as evenly as possible. Then place it back on the parchment paper. Do this with all 24 sticks. Once you are finished, you can return the pan to the freezer to cook them at a later time, or you can put them right into the oven. Be careful about putting a baking dish straight from the freezer into the oven. Most types should be left out to thaw for a while first. But if you’re using parchment paper this is a non-issue, because you can very easily transfer the paper (if you have enough to grab on the edges!) into a separate dish for baking. 3. Bake at 400 for 4 to 5 minutes, and then turn the pan and cook 4 to 5 more minutes. I went a bit longer than 10 minutes on the ones in the picture, which is why they look a bit wider. Still just as delicious though! Enjoy with gluten-free marinara sauce, or whatever condiment you prefer with mozzarella sticks.